The lines on, and leading to, the Cambrian Coast were visited often during family holidays in the 1950s and 1960s and became firm favourites. I didn't have a camera during the early visits but managed quite a few shots in the last years of steam and as the DMUs took over. 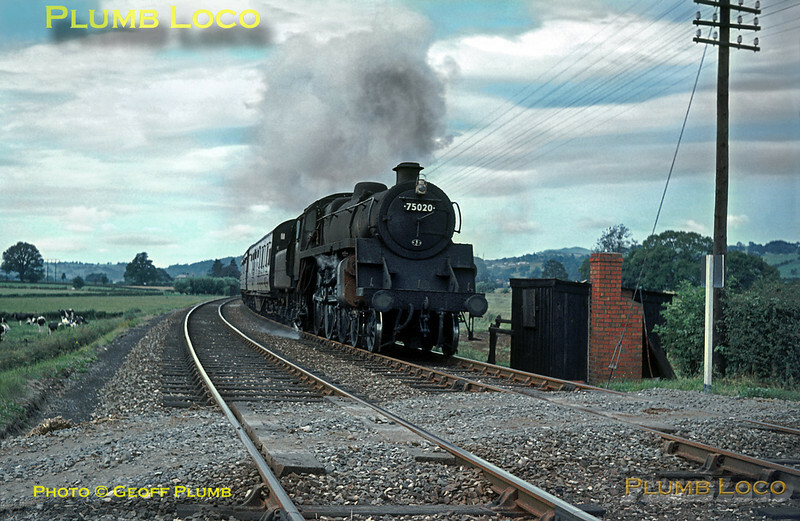 I have been fortunate enough to find various original slides to add to my collection to fill in some of the early gaps of trains I recall but did not photograph myself. There are also more recent shots from the steam specials that have run over the line over the past few years. Many more shots to add as time permits - as usual! BR Standard 4-6-0 No. 75020 is now returning from Welshpool with the 12:06 departure to Oswestry, here approaching the occupation crossing near Buttington Hall. The tracks here were two parallel single tracks, one for the Oswestry line and one for the Shrewsbury line, both operated bi-directionally to the former junction at Buttington which was "rationalised" after the station's closure. The line to Oswestry was closed in 1965 and lifted, leaving just a single track at this location. Monday 27th July 1964. Slide No. 835. Great compositions which take me back. You always manage to expose the skies just right too! Great photos! Just been on holiday on the Cambrian Coast- the countryside still looks the same- just a lot fewer tracks at the stations now! Is 5 the best rating or the other way around, i.e. 1 the best??? ?